Recommended: Yes (for email marketing). No for starting an online business from start to finish the right way). I first came across Inbox Blueprint a few months ago while doing some research on email marketing. I did the free training and joined in on the free 2-hour long webinar. I was totally blown away by the quality of the content being presented by Anik Singal, the founder of Lurn Academy which hosts the Inbox Blueprint program. Having a guest appearance by business partner (only for this venture) Robert Kiyosaki was also a jaw-dropping experience for me. Robert Kiyosaki is one of the greatest business men out there. I first read his book, “Rich Dad, Poor Dad” back in high school. At that time, I thought it was a departure from the norm, from what I was taught in school. So, I found that interesting. Robert made a lasting impression on me. So, for Robert Kiyosaki to endorse Anik Singal’s product was a big deal for me. In the free training (which you could access here), Anik broke down the essence of an online business and delved into what email marketing was all about. He showed the 5-step approach to email marketing, which he used in his business for many years to make millions online. This 5-step approach was so simple, yet very powerful. Many people know it, but few people really understand it. Basically, you get traffic to your website/web page and get them to opt-in to your email list by giving something away for free. You then redirect them to your Thank You Page (TYP) where you sell them an affiliate product. Later down the road, you can then keep selling them new products (either affiliate or your own product) because you own the list of emails – your #1 asset as an online marketer. If you are interested in learning about the vast world of online marketing, even if you have no experience at all, then click the button below to get instant access to the free Digital Bootcamp course (consisting of 9 videos and 200 minutes of free training). Anik claims that in addition to teaching you secrets to do email marketing properly if you just copy and paste his “time-tested, multi-million-dollar Inbox Blueprint system” you will be able to grow your business exponentially. This is the same system Anik used to make more than $50 million as a solopreneur. 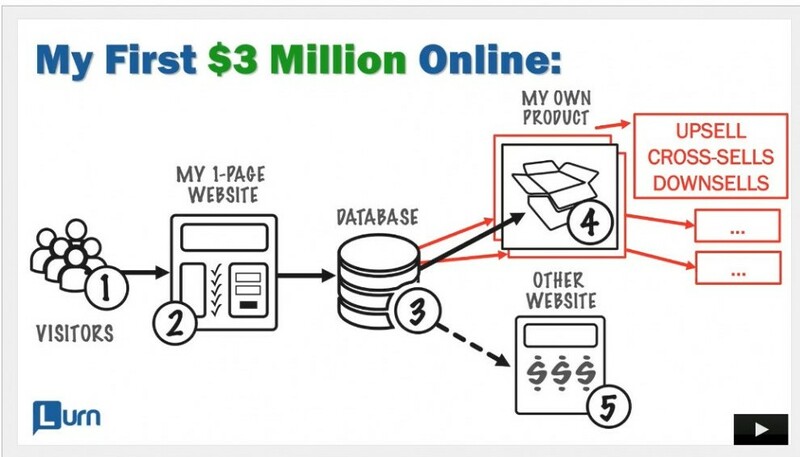 Anik claims that it took him over 18 months before he made a cent on his online business. He was hustling every day and doing everything he thought was needed to make money online. Engaging people and creating content on all the key forums relating to his niche was one of his key strategies he used to build relationships. But he found it was taking way too long. When he was shown how to effectively carry out email marketing (the right way), only then did he begin to make money. So of course, I was intrigued. I signed up for the free training program immediately. From just doing the free training alone, I implemented some ideas outlined and immediately saw results on my website. The very first day of implementing just a couple of the ideas highlighted in the Inbox Blueprint I got 7 people to sign up within an hour of making one decisive action. Since that, I’ve been building and building more and more elements of the system and I’m seeing great results already. In addition, I have observed dozens of online marketers and subscribed to their mailing list and have been reverse engineering their strategies. Everything that Anik spoke about, I’ve observed being implemented by virtually all the online ‘gurus’, with one or two exceptions. What’s Included in Inbox Blueprint? The Inbox Blueprint system includes everything you need to know to launch your online business, grow a massive email list, and to market and sell your products (owned or affiliate) online. One of the core areas that Inbox Blueprint covers is everything you need to know about effective email marketing. The first module of the Inbox Blueprint deals with a very important element of an online business – selecting the right niche. Picking the right niche is critical to the success of your business. When I first started my online business, I fell into the error of picking the wrong niche. Ideally, you want to choose a niche with high demand and low competition. Inbox Blueprint shows you how you can even compete in a competitive niche using a really neat trick. They don’t call this module the Addiction Meter for nothing. Basically, this module will teach you how to determine how ‘addicted’ people are to a particular product or idea using a variety of techniques. If I had gone through the Inbox Blueprint training before I started my online business, I would not have fallen into the mistake of selecting a niche that was not suitable for me as a beginner. Without the training, I chose a niche based on my gut feeling and on a few keyword searches. That was not enough. There are so many ways to do niche research. Inbox Blueprint provides training on a variety of ways to carry out effective research to select the right niche for you. By combining all the above research methods you will be able to identify profitable, ‘low-hanging-fruit’ niches. The method that really stood out for me was using Facebook audience insights. Although I was aware of the targeting power of Facebook, I never thought of using it as a niche research tool. I was utterly blown away at the level of targeting and refining you could do. And the evidence clearly demonstrates which niches are worth it and which ones have little or no demand. Obviously, Facebook is not the only tool out there, but as the second largest online advertising platform, with nearly 2 billion users, it is extremely significant. In picking a niche, you want to ensure that it is evergreen. Simply put, an evergreen niche is a niche that will never die out. It will be around 30, 40, 50 years from now. For example, people will always fall in love, so the relationship niche is an evergreen niche. People will always play the guitar or golf or tennis. They will always seek personal and spiritual development. Those are the types of niches that are evergreen. They will always be around. Certain niches that are not evergreen are electronics and fashion for instance. Consider the smartphones. When one version is released, a newer version is right around the corner. All the work you put in creating content for the one version of a smartphone will become obsolete when a new version is released. If you’re selling guitar lessons, for instance, you could literally pass on the content on your website to your children and grandchildren because guitars are going to be around for a long time. That’s an evergreen niche. I rate this module 10/10 for the practical and easy-to-use advice provided and the variety of ways you could do niche research. The second module or step is the Bait. When you first hear the term bait you think of a trap; trying to catch someone. However, bait simply refers to the ethical offer you present to someone in exchange for their email address and other contact information. It is a gift containing valuable content or information that can actually help someone or enhance their life in some way. I say “ethical offer” because you should never trick people into giving you their email or contact information by saying you’re going to give them something of value when in fact you are not. That’s totally unethical. I’m quite used to opting into someone’s list in exchange for some piece of content such as an ebook. There have been a few times when their offer was anything but valuable. Although they may have gotten my contact details, they lost a potential client. They diminished the value of their brand as a result. TYP simply means Thank You Page. After someone signs up on your opt-in page in order to receive their free gift, they should be redirected to a thank you page. Many marketers miss the opportunity to use their thank you page as a marketing tool. You never stop marketing. Step three of the Inbox Blueprint program teaches you how to make your thank you page work for you. It’s not really about saying thank you. It’s really about guiding your new prospect into your marketing funnel and getting them to convert from a contact into a customer. And it all starts with the thank you page. Inbox Blueprint with show you the #1 strategy for using your thank you page as a marketing tool par excellence. It also shows you how to apply for the Clickbank thank you page. As the name suggests, email marketing is really a virtual machine. A machine that, once you turn it on and oil regularly, will generate income for you in ways many other marketing activities will never be able to. And the best part is that email marketing is virtually free. Inbox Blueprint will show you how to set up your email marketing machine to work for you even when you are not working. The email machine will work for you even while you sleep. That’s the kind of business you want to have. Another great aspect of Inbox Blueprint is that it will show you how to run effective analytics to monitor, measure and evaluate your email marketing strategy. Learn about A/B testing; click through rates, conversion rates and much more. Learn about your email marketing funnel and how to optimize it at all stages through the funnel. One of the key messages of Inbox Blueprint is that email is not just about sales but more importantly, it is about building relationships; relationships that will create lifetime customers and generate lifetime income. Marketing is more than just trying to get a sale. It’s about building relationships, which takes time. The objective is to create lifetime, loyal customers that keep buying from you over and over again. There is only really one way to build customer relationship. And that is by offering real value – in your content, in your product, and in your emails. Inbox Blueprint gives you a solid foundation for relationship building through email marketing techniques. 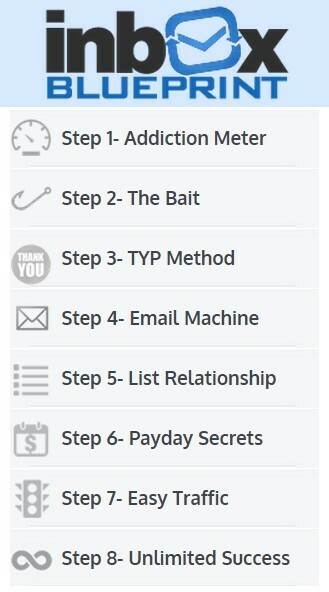 As the name suggests, step 6 of Inbox Blueprint is all about how to make money with email marketing. Learn how to monetize your email list. You can’t get away from it. Email marketing still requires traffic. You need to have traffic in order to generate leads. The more traffic you receive, the more leads you will create. Email marketing is only as effective as opens, click-throughs, and conversion. If no one opens your email, then it’s a big waste. Or if your emails are opened but no one clicks on your links, your email marketing strategy would have been for naught. The measure of success in email marketing is ultimately conversion. This module teaches you how to optimize your email marketing strategy at every level of the email funnel. Inbox Blueprint shows you how to measure and monitor different metrics for your email marketing strategy. It shows you what metrics are industry standard so that you could determine if you are in line with the average or if you need to up your game. Definitely not. Inbox Blueprint is not a scam. It is one of the best programmes out there if you’re looking to learn the ins and outs of email marketing for your online business. However, if you really want a comprehensive program that will guide you through the process of creating your own online business, then Inbox Blueprint may have some flaws. First of all, because Inbox Blueprint has an automated, ready-made solution in terms of the Launchpad feature, you will miss out on all the training and experience in setting up an online business from scratch; an invaluable lesson that all online business owners need to have. Secondly, because most of the content including emails, and website content is already done for you, you will lose out on the critical lessons in search engine optimization; a lesson that ALL online loggers and website owners need to fully understand whether you are selling your own product or an affiliate product. A third aspect that I do not generally agree with is the perception created in the training. There is this general feeling that once you use Launchpad and set up a website in one of the recommended, ready-to-use niches you will start earning income fairly soon. This gives people a false mindset. In reality, building an online business takes time, effort and consistency. Don’t get me wrong. There are some instances where you can start earning right away. For example, if you already have an email list. However, most people now starting off do not have access to an email list. So Inbox Blueprint is really great if what you want to learn is email marketing. Click on the button below to get access to a free email digital marketing course by Anik Singal. However, if you want to get a start-to-finish approach to building a successful online business, then I would not consider Inbox Blueprint as the first option to choose from. 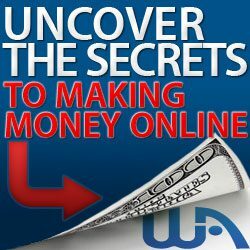 My #1 recommendation for a comprehensive training system, including the right tools (keyword tool, hosting, website building tools and themes) is Wealthy Affiliate. Check it out here. *At the time this article was being produced. Price may change or vary from one point in time to another. 2 Comments to Review of Inbox BluePrint by Anik Singal – Legit or Scam? thanks Derk. That’s nice of you.